Christmas stockings originated from drying shrooms. Vikings would gather fresh magic mushrooms in the Scandinavian forests and quickly dry them by placing the shrooms in their socks, hanging them overnight above the fire. When morning came, they had plenty of dried shrooms just waiting to be consumed. Christmas stockings originated from drying shrooms in a white sock overnight. The sock would usually be filled with those red capped and white dotted fly agaric mushrooms. The red colouring of the fly agaric would leak into the white sock creating a red sock with a white rim from where the string tied it off at the top. Back in Pagan times, red nosed reindeer lead the way of the tribes. Reindeer also loved fly agaric mushrooms. And the reindeer that ate the most had the reddest nose. Vikings would also consume lots of fly agaric mushrooms and go into berserk alongside the reindeer, following the most stoned and energized of them all, calling him Rudolf. How to shroom when reindeer ate your patch of magic mushrooms. Vikings would find the reindeer that ate their stash, and follow them around with a beer mug or wooden bowl. When the reindeer had to pee, they would capture the pee and drink it. Some might be very disgusted by this, but reindeer pee is more tasty than human pee. It’s comparable to camel pee, which isn;t all that bad when your extremely thirsty. 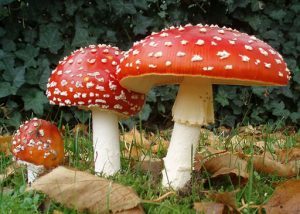 Fly agaric isn’t the most popular magic mushroom these days because of their unpleasant side effects. They are psychoactive and hallucinogenic mushrooms without psilocybin. They contain alkaloids muscimol, ibotenic acid and muscazone. These all mess with your neurotransmitter receptors in your central nervous system. This can cause psychotropic poisoning which may be severe in some cases although deaths are very rare. NOTE: Please feel free to add more to this article by leaving your comments below.